San Diego is world-renowned for its picture-perfect weather. This alone makes nature and outdoor activities a virtual slam-dunk when planning a visit here. There’s so much to do in America’s Finest City. Whether visitors are seeking the bold, the exciting, or the brand new adventure, San Diego won’t disappoint—she offers a myriad of awesome choices. 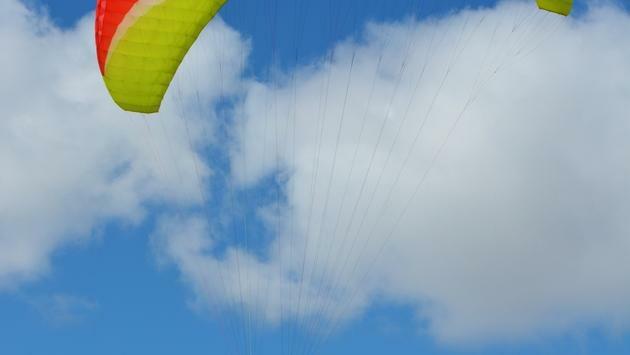 Those who haven’t experienced paragliding must try it here in San Diego at the Torrey Pines Gliderport. It wasn’t just exhilarating; this aerial sport provided a sense of total awe-inspiring freedom. Located on the steep sea cliffs of Torrey Pines in La Jolla, where Charles Lindbergh took his first maiden flight, the Gliderport services aviators of varying experiences. Even novice fliers can enjoy the thrill of paragliding, flying in tandem with a certified instructor. Gliders take off and land from a picturesque location offering spectacular views of the Pacific Ocean, the Torrey Pines cliffs and the city of La Jolla. Ocean kayaking in La Jolla was amazing as we paddled through the La Jolla Ecological Reserve’s kelp forest filled with fascinating marine life. Barking sea lions, basking harbor seals, and gracefully cruising leopard sharks were our constant companions as we navigated the cool waters of the bay. The La Jolla Caves have piqued the interest of curious onlookers since 1902 when the first of seven caves was discovered here. Access to the caves is permitted only by guided tour. Expert guides from Bike & Kayak Tours lead kayakers along the 75-million-year-old sandstone sea cliff to the caves providing amazing views of these magnificent formations. Another amazing way to see the stunning La Jolla formations is by snorkeling through this incredible protected ocean sanctuary. The warm sunny day we donned our wetsuits, masks and fins, we not only saw schools of colorful fish, octopus, lobster, a stingray and crabs hiding among the rocky reefs of the La Jolla shores, but we got a close-up glimpse of leopard sharks inhabiting these waters. La Jolla is home to the largest annual aggregation of leopard sharks in the world. And from mid-June to early December, these beautifully spotted non-threatening ocean creatures have no problem sharing the waters of the cove with swimmers, divers and snorkelers. San Diego is an ideal hiking destination. Guaranteed there’s a trail to meet the whims and needs of hikers of every level. Because of its spectacular vistas, one of our favorite hikes is Torrey Pines State Natural Reserve. The reserve’s well-maintained wilderness paths lead to breathtaking views of the Pacific Ocean atop lofty cliffs overlooking miles of magnificent coastal beach. Surrounded by stunning sandstone formations, the Reserve offers multiple winding trails of varying lengths and difficulties lined with picturesque pines, desert succulents and colorful wildflowers. 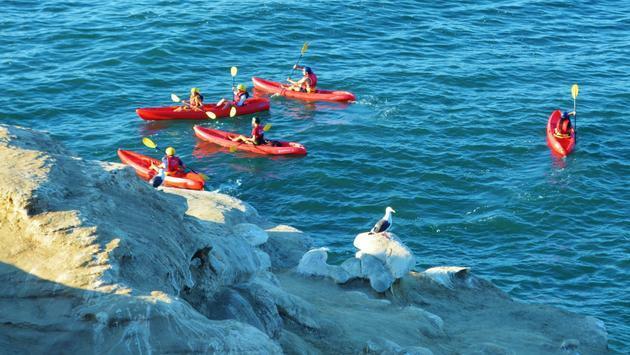 Sunset Cliffs may be the most relaxing and enchanting urban hike in San Diego. Showcasing the vast beauty of the coastline with 1.5-miles of majestic sea cliffs and tide pools, this hike is thoroughly enjoyable. Nature abounds here. Those heading to the cliffs in the late afternoon are likely to spot bottlenose dolphins and seals splashing along the rocks. Not to mention, sunsets here are among San Diego’s most awe-inspiring. A rite of passage for more experienced hikers is to take on Mount Woodson in North County to reach the fascinating outcropping known as Potato Chip Rock. Lined with massive boulders towering over the 6.4-miles of zigzagging trail, the challenging hike leads to one of the highest peaks in the county providing stunning panoramic views of Lake Poway and Palomar Mountain. San Diego has the warmest water and some of the best surfing breaks on the California Coast. Its 70 miles of open ocean coastline beckon visitors and locals alike to paddle out to catch the big one. From south Imperial Beach to north Oceanside and lots of beaches in between, San Diego can be surfed year-round. Local wave-riders here all have their favorite spots like Black’s Beach and La Jolla Shores, Del Mar, and Swami’s in North County Encinitas. For those who’ve never surfed but always wanted to, San Diego has numerous surfing schools for every age group and experience level. And there’s also body-boarding—it’s like sled riding on water. Non-surfing spectators can watch all the wave action from piers in Ocean Beach, Pacific Beach and Oceanside. San Diego is a stunningly beautiful city and there are many ways to explore this water wonderland. For a relaxing two-hour 13-mile trip around the bay, San Diego Hornblower Cruises provides visitors close up views of the amazing historic Star of India, USS Midway WWII carrier, Coronado Bay Bridge and Navy ships. Tour guides point out over 50 San Diego landmarks and the amazing marine life that lives in the San Diego waters. For those seeking a tad more adventure, Hornblower offers dolphin and whale-watching cruises. Winter whale watching tours to see the gray whale migration begins in early December. Each year, more than 20,000 gray whales make a 10,000-mile round-trip journey from Alaska to Baja California where females birth their calves. Along the migration path, San Diego is an ideal place to see this impressive parade of gentle giants. For anyone desiring the sun on their face and wind in their hair, sailing is a great way to take in the glittering San Diego Bay by day, especially around sunset. A variety of choices range from group to private sails and includes half or full-day excursions. Being out on the water is the perfect way to reset your compass. It’s relaxing, invigorating and incredibly satisfying. What makes San Diego such a desirable destination is that the great outdoors here on the magnificent California Coast can be enjoyed year-round.